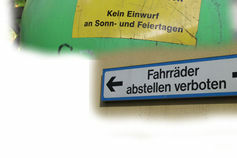 Germany - too much order and rules? Some German emigrants feel that Australia is a less rule-governed place than Germany (e.g. Regine). 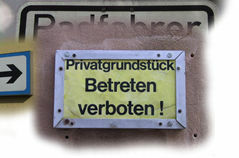 Indeed, verboten (prohibited) signs such as these (see the photos above) are not as widespread in Australia as in Germany. 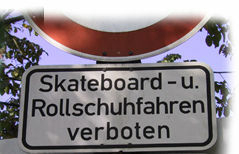 A German proverb seems to indicate that the Germans particularly like order and regulations: "Ordnung muss sein!" ("There has to be order"). 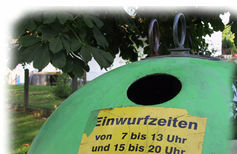 The photos show (clockwise from top-left): a public recycling bin for glass - there are fixed times when you are allowed to deposit glass there; skateboards and rollerskating prohibited; entry prohibited; parking of bikes prohibited.